The LANCW12 Series offers 12 watts of output power from a package in an IC compatible 24pin DIP configuration. 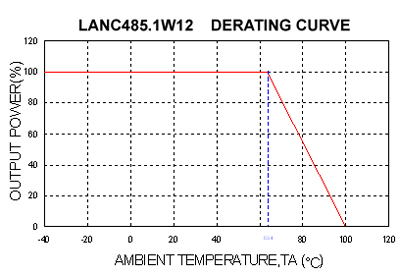 LANCW12 Series models have 2:1 wide input voltage ranges of 9-18, 18-36, and 36-75VDC. The LANCW12 features 1600VDC of isolation and short circuit protection as well as five sided shielding. All models are particularly suited to telecommunications, industrial, mobile telecom and test equipment applications. 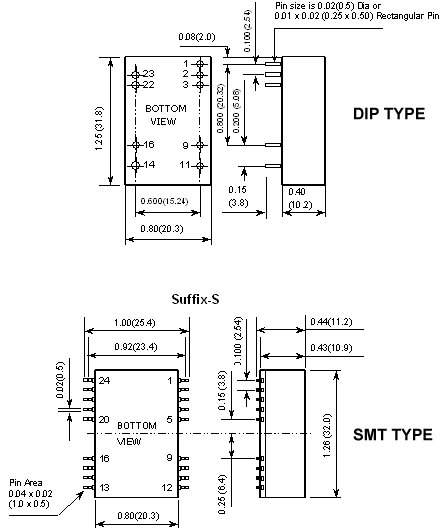 Surface mount models are also available. Notes: 1. Add suffix "S" for SMT type. 2. MTBF: BELLCORE TR-NWT-000332. Case 1: 50% Stress, Temperature at 40°C. (Ground fixed and controlled environment). 3. The ON/OFF control pin voltage is referenced to -Vin. 4. The LANCW12 Series can meet EN55022 Class A with an external capacitor in parallel with the input pins.